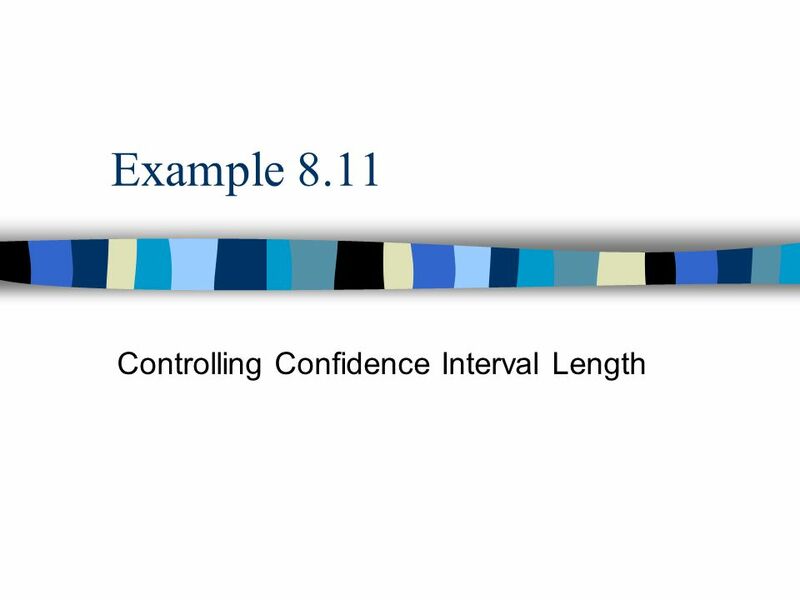 Example 8.11 Controlling Confidence Interval Length. 2 8.18.1 | 8.2 | 8.3 | 8.4 | 8.5 | 8.6 | 8.7 | 8.8 | 8.9 | 8.10 | 8.12 | 8.13 | 8.148.28.38.48.58.68.78.88.98.108.128.138.14 Background Information n The fast-food manager in Example 8.1 surveyed 40 customers, each of whom rated a new sandwich on a scale of 1 to 10. n Based on the data, a 95% confidence interval for the mean rating of all potential customers extended from 5.739 to 6.761, for a half-length of (6.761-5.379)/2 = 0.511. n How large a sample would be needed to reduce this half-length to approximately 0.3? 3 8.18.1 | 8.2 | 8.3 | 8.4 | 8.5 | 8.6 | 8.7 | 8.8 | 8.9 | 8.10 | 8.12 | 8.13 | 8.148.28.38.48.58.68.78.88.98.108.128.138.14 Confidence Intervals n Confidence intervals are a function of three things: –the data in the sample We have control over the data by using the various random sampling plans to reduce variability. An area of statistics called experimental design suggests how to perform experiments to obtain the most information from a given amount of sample data. –the confidence level This effect is clear as the confidence level increases, the length of the confidence interval increases as well. 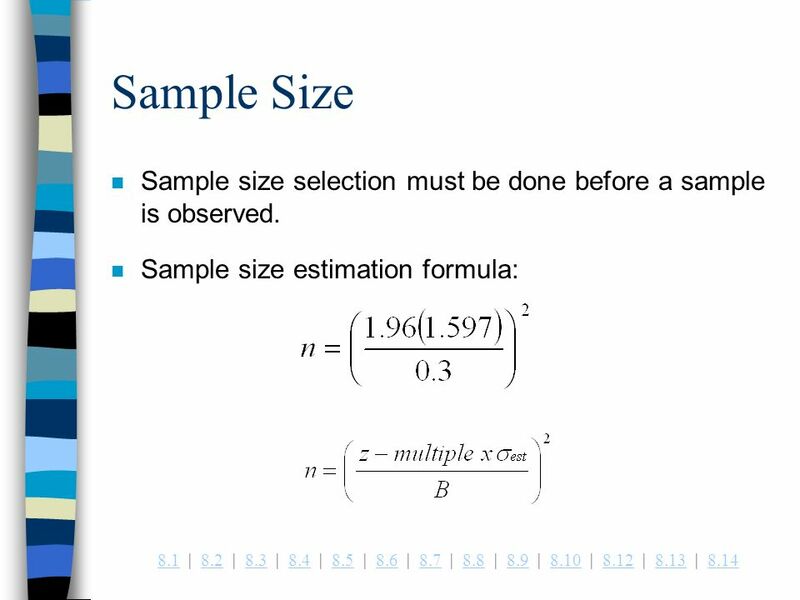 –the sample size(s) The most obvious way to control confidence interval length is to choose the size of the sample appropriately. 5 8.18.1 | 8.2 | 8.3 | 8.4 | 8.5 | 8.6 | 8.7 | 8.8 | 8.9 | 8.10 | 8.12 | 8.13 | 8.148.28.38.48.58.68.78.88.98.108.128.138.14 Calculations n The formula for n uses three inputs: –the z multiple, which is 1.96 for a 95% confidence level; –the prescribed confidence interval half-length B, which is 0.3; –and an estimate sigma est of the standard deviation n The final input must be guessed, but for this example with a sample size 40 we can use the observed sample standard deviation of 1.597 (which can be determined with the STDEV function). 6 8.18.1 | 8.2 | 8.3 | 8.4 | 8.5 | 8.6 | 8.7 | 8.8 | 8.9 | 8.10 | 8.12 | 8.13 | 8.148.28.38.48.58.68.78.88.98.108.128.138.14 Calculations -- continued n The formula yields a rounded result of n = 109. n The claim, then is that the manager surveys 109 customers with a 95% confidence interval will have the approximate half length of 0.3. 7 8.18.1 | 8.2 | 8.3 | 8.4 | 8.5 | 8.6 | 8.7 | 8.8 | 8.9 | 8.10 | 8.12 | 8.13 | 8.148.28.38.48.58.68.78.88.98.108.128.138.14 Calculations -- continued n The same calculations can be done using the Sample Size Selection procedure of Excels StatPro add-in. 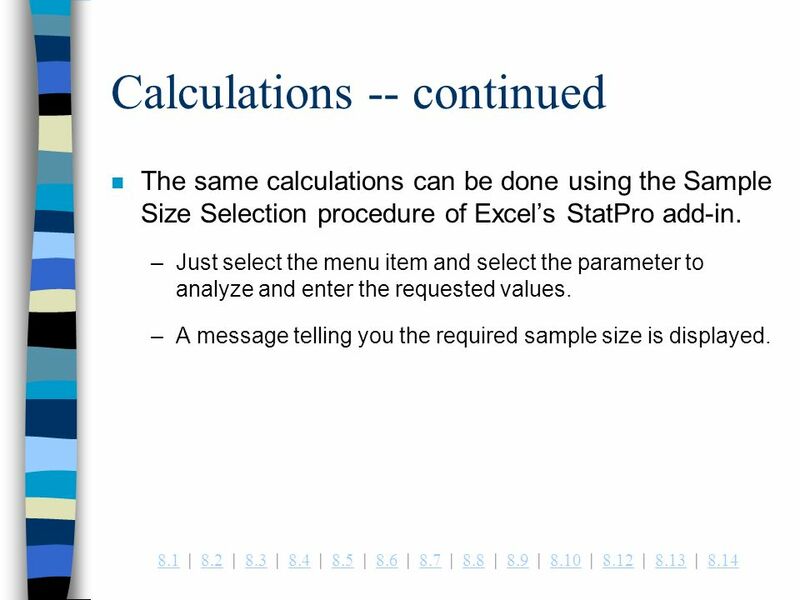 –Just select the menu item and select the parameter to analyze and enter the requested values. 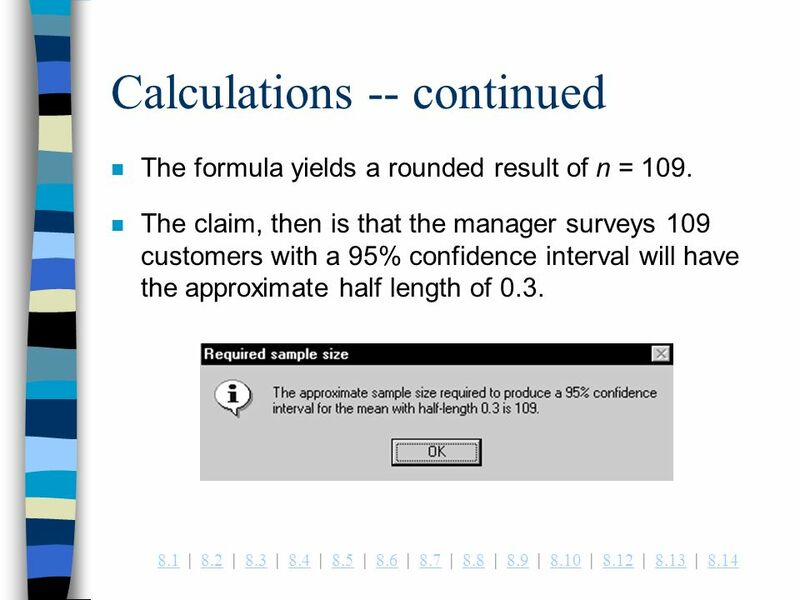 –A message telling you the required sample size is displayed. 8 8.18.1 | 8.2 | 8.3 | 8.4 | 8.5 | 8.6 | 8.7 | 8.8 | 8.9 | 8.10 | 8.12 | 8.13 | 8.148.28.38.48.58.68.78.88.98.108.128.138.14 Question n What if the manager was at the planning stage and didnt have a preliminary sample of size 40? 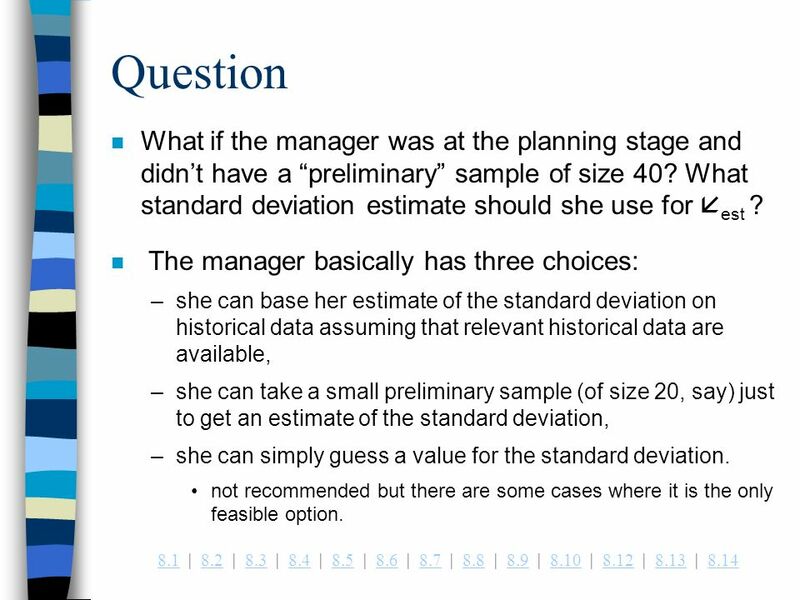 What standard deviation estimate should she use for est ? n The manager basically has three choices: –she can base her estimate of the standard deviation on historical data assuming that relevant historical data are available, –she can take a small preliminary sample (of size 20, say) just to get an estimate of the standard deviation, –she can simply guess a value for the standard deviation. not recommended but there are some cases where it is the only feasible option. 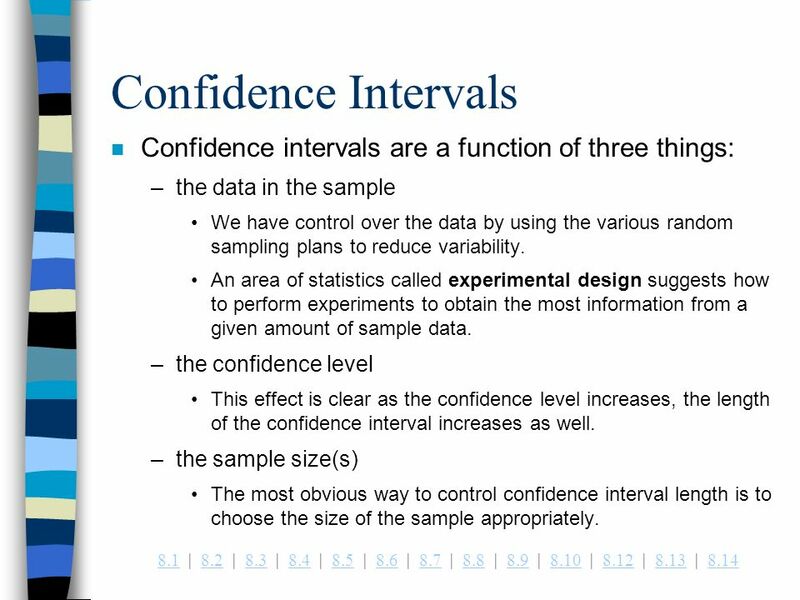 Download ppt "Example 8.11 Controlling Confidence Interval Length." Research Methods in Politics Chapter 14 1 Research Methods in Politics 14 Understanding Inferential Statistics. Chapter 12: Inference for Proportions BY: Lindsey Van Cleave. 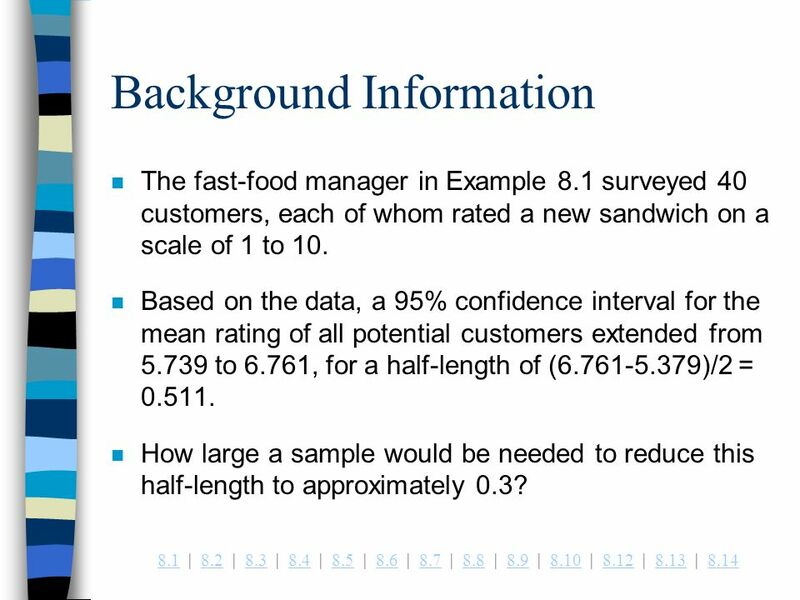 Example 9.4 Estimating the Response to a New Sandwich Confidence Interval for a Proportion. 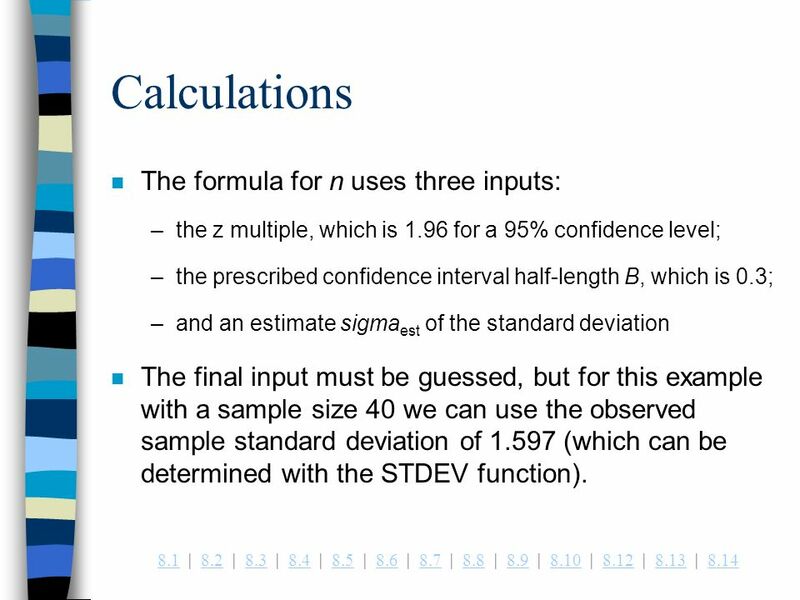 Example 8.12 Controlling Confidence Interval Length.